The Mane Objective: Wash and Go = Protective Styling? Wash and Go = Protective Styling? If you follow me on Instagram or keep up with me on the blog, then you know I live in the wash and go. I switch up my products to keep it interesting, but I've got the technique down to a science. The wash and go gets a bad rep, because the hair is left to curl, coil, kink, and clump freely while being exposed to the elements, and depending upon the length of your hair, being exposed to rubbing against your clothing as well. By contrast, protective styling involves tucking the hair away into twists, braids and updos that keep the hair from tangling, snagging, and breaking. In protective styling, the ends of the hair are often tucked away, to encourage length retention. So how is it possible that such an "out" style can be considered protective? The wash and go is considered a low manipulation style for two reasons. 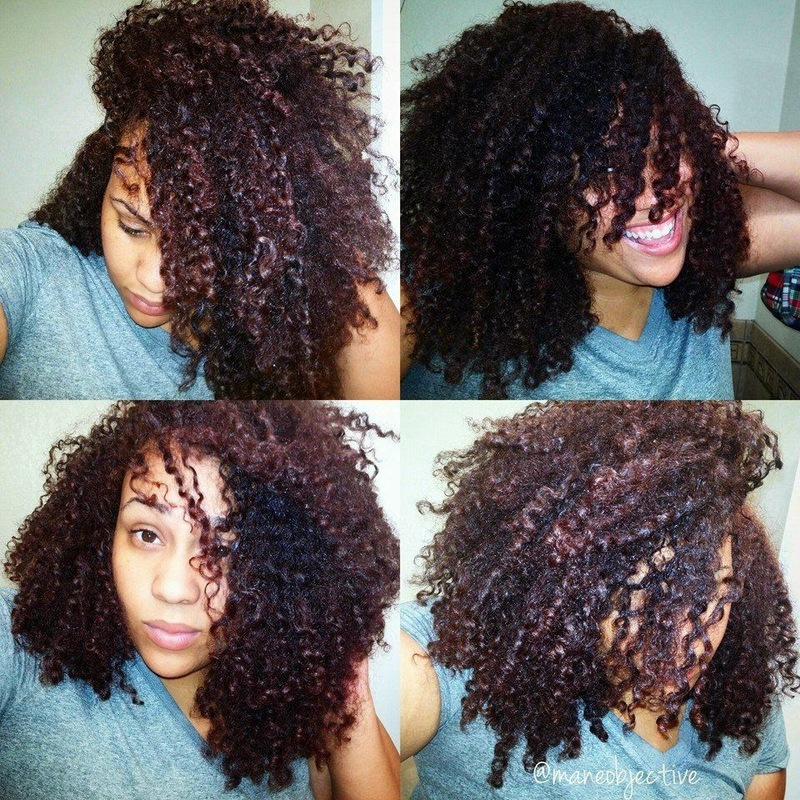 One, unlike twist-outs, braid-outs, and other styles, the wash and go doesn't require any tugging pulling, or stretching (unless you're into that sort of thing). 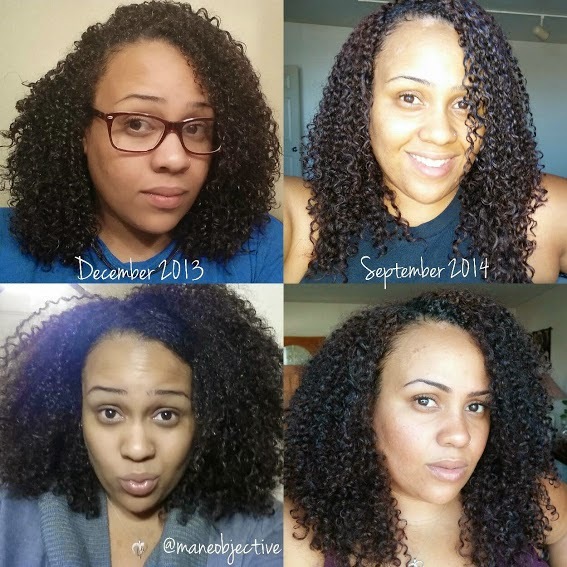 You simply wash, deep condition, add product, and keep it moving. Of course, you can plop, diffuse, and add other steps, but at it's core the wash and go is a relatively simple style to pull off that doesn't require you to excessively manipulate your hair. The second reason is that when done correctly, wash and go's can last anywhere from 3 to 10 days. Maintenance (at most) involves spritzing and applying water-based products and oil to seal the ends of the hair, and protecting it at night. No combing, no re-twisting or braiding at night means that for several days at a time, the hair is left unmanipulated -- rendering it protected. When we think of sealing our hair, typically an oil or butter comes to mind. It rarely occurs to us that gel is a sealant, too. In fact, the gel cast that forms after you apply your product envelopes and clumps your curls locks in moisture and keeps your hair protected. Additionally, the gel cast helps reduce tangling by holding curls together. I know we typically look down upon crunchy curls, but if you're looking for maximum protection, firmer hold gels will yield the best results. Besides, the gel cast wears off -- and you can even scrunch it out with a little oil or butter. Work gel through the hair in sections to ensure full coverage and protection. When it comes to withstanding the elements and resisting breakage, clumped curls via wash and go's are especially beneficial. Clumped curls are stronger than separated strands, and are less prone to breakage and damage. Curls that clump together last longer, so make sure you use the "praying hands" or rake & shake to smooth product through and encourage clumping. This article originally appeared on NaturallyCurly.com. Christina - have you seen a chart comparing the relative hold and film forming ability of curl gels and custards? Similar to how Eco-styler rates its product's hold level on scale of 5 - 10? I have so many loser (looser) gels in my "rejects tote". Hello, talking about you SM curling gel soufflé and you too Alaffia Beautiful Curls!. Thanks always for your in-depth reviews! Yes! on SM curling gel soufflé, they truly hurt my feeling with that one! I just knew I was gonna have perfect defined curls that smelled like coconut & hibiscus... I was wrong, lol! Yeah, I hear you with the curl gels. With my tightly coiled 4a-c mane, they don't always agree. I have yet to find a chart or anything rating them. But to mitigate being the not-so-proud owner of failed products, I only purchase them when they are on the ground so I can test them out in the store. Buying from places that accept used returns helps (i.e.- Target, Sally's, and Ulta). Also, try to pry them open in the store, check the consistency (i.e.- is it sticky, watery, runny, etc...). When I want a product to stand on its on I only go for those with a lot of moisture-- they have to be very creamy. They also have to have a guminess to them so I know they have hold. If need be, you may need to apply a spray gel or something on top. To salvage some of your products, you may have to pair them with something that has whatever it is lacking. So you can try adding a liquid form gel to those failed curling creams. (i.e.- HE totally twisted, Curls Goddess gel, or something with a bit more hold) I ONLY use custards for refreshing old wash-n-go's. They never stand on their own with my hair. I just add some light moisturizing lotion on top of damp hair and then rake the custard through my hair. Those are my tips. Hope you find something that works or someone that can be the beneficiary of those products you have. Oh I forgot to mention. When I wanted to refresh my old twist out this week I used Jane Carter's curl defining cream (the one for tighter coils). It definitely defined my coils. I haven't tried it yet on freshly washed hair to vouch for it, but I'm sure if I was going for a longer hold I would have to add some spray gel--like SM curl & shine spray--to it. If my hair was long enough, I would have just left it with the soft hold and thrown it back into an afro puff or something. You know, I thought about cocktailing KCCC with MJ-Jelly soft curls the other day!! Tried it at the nape of my neck on an old KCCC/KCKT WNG and it looked promising. I was also researching Obia Natural curl custard and read a review mentioning a 'dry WNG' YouTube video by RegalFro; I found it titled "shingling on dry stretched hair". It's bookmarked for my to-try list! What type of custards have you find success with? No probs sis! And I should have mentioned that I remember you from Curly Nikki's site. I haven't been over there in a while. The caveat is they only work well for me when I've already applied gel (like Ecostyler argan oil with level 10 hold). At this point the custard is simply reactivating the hold. But it looks really good when I'm done. I'll check out that vid from RegalFro when I get the chance. Thanks for mentioning it. I used to be a die hard protective styler I was the queen of various style changes. In October Iwatched Taren Guy Salon series with Dickey and I had a light bulb moment Ive tried wash and wear in the past but it always was a fail. My first point of call was a salon for a shaped layered hair cut I got at least 4/5 inches cut off, after the cut I started the experiment. I started co washing my hair regularly every 3/4 days and experimented with styling products I followed the mane objective 7 steps for perfecting a wash and go. I can honestly say I've cracked it. I remember your name too! Let's Jam custard was a fail for me last year. I put ecostyler on the no-no list since my MHM days. I no longer strictly follow MHM, but incorporate some of the steps into my regimen! I'm curious about the steps you incorporated from the MHM routine. Hope you share! I never tried it. I have high porosity hair, and although the MHM method left my hair more moisturized, the fear of using baking soda scared me off. MHM is tailored for low-porosity strands. I started eliminating ingredients on their 'no-no' list and discovered my hair felt more moisturized - less like a brillo pad! The MHM method was too long for me to do regularly, so I eventually started an abbreviated regimen. I continue to use KCCC/KCKT, the bentonite clay, occasionally co-wash, and avoid the no-no ingredients. I do an aphogee two step every 6 weeks to address porosity. Curly Nikki did an article about Max hydration last July 29, 2014. One writer named "Dubaidee4c" posted lots of helpful tips and before-and-after photos. You may not find her posts due to all the "Yeps, nopes, uh-huhs" from folks trying to win the conditioning basket contest, LOL! Check out MsDeeKay's website for helpful MHM interviews. Also check out Christina's "ManeObjective" tips on bentonite clay rinses. ""Yeps, nopes, uh-huhs" from folks trying to win the conditioning basket contest"
LMAOOF :-D and smh. That site has gone downhill. I wish there was some way to stop following threads. I remembered this conversation and had to share this with you. Let me disclose first, I made the sad mistake of using Jane Carter shampoo, which left my hair matted and dry.And no I did not pre-poo. Plus, my DC had no slip to it, so I just knew I was doomed for failure. Well...let me show you the pics of my hair after using Aunt Jackie's leave in conditioner "knot on my watch". (first one below). That's my hair soaking wet, previously looking a hot mess. At this point I'm crossing fingers hoping these results hold up when I start adding the styler. I must say, I have never had hair that defined from just a leave in. Normally it's coily, but too watered down to last. Next, I used Eden BW pudding souffle and Aunt Jackie's flaxseed gel (per Chrstina's video) The next pics are my hair after letting it dry. It feels like it has enough hold for even humid weather. I'm going to experiment with Camille Rose's gel and some of my other loose ones to see if AJ's detangler can even salvage those. My suspicion is that these liquid gels only work well if you've already achieved some level of definition, which can come from using more moisturizing leave-ins. Never knew my faithful few leave-ins weren't cutting the mustard. Your hair looks great, really healthy, great style definition! My Target expanded their natural and curly product aisle and I PJ splurged on Camille Rose Curlmaker and MopTop custard. I found the same thing happened with me and the Jane Carter shampoo as well as one of the Carol's Daughter shampoo. My hair 'seized', that's the best description I can use to describe how it felt afterwards! Since I'm a lazy natural (no cocktailing here), I may never progress beyond my diluted Knot Today and KCCC! I will have to watch the video! No cones unless I'm at the beach or desperate! LOL! LMAO Well that's where I'm at-- desperate!